*This upgrade is meant for urethane bushings that are used on most aftermarket swaybar kits. The nature of the urethane bushings require lubrication maintenance every so often or else squeaking and clunking noises will start to occur. The silicone grease that's normally recommended works, but doesn't last long. A better alternative that I've found was using Teflon tape. It performs the same, if not better, it lasts longer, and it's much cleaner than the greasy crapp. Tools needed: Ratchet & socket set. Step1: Drive the front or the rear end (depending on which side you're doing) on a ramp. Jacking up the car on jack stands is an alternative. Step2: Unbolt both bushing brackets. *Make sure you're holding the bar when removing the last bolt because it will drop to a certain point. Step3: Remove the bushings and clean everything: bushings, mounting area, bushing brackets, and swaybar. I used WD-40 to clean the surfaces because it cuts through grease and grime very quickly. 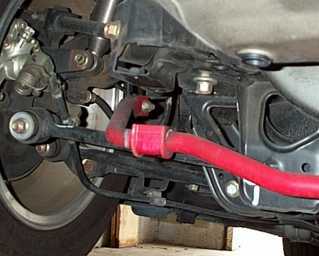 Cleanup the swaybar with simple green to remove any residue of WD-40 since you need the surface to be squeaky clean. 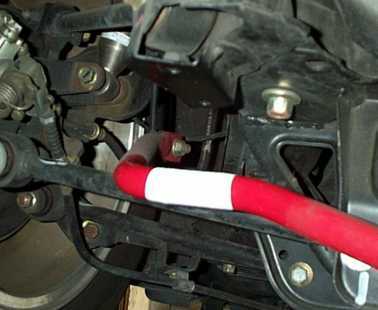 Step4: Apply the Teflon tape to the swaybar. Make sure there are no creases, keep it flat. Apply about 3 to 4 layers of it. *Tip: start from the middle so you finish at the middle. If you finish at the end, you might have the teflon tape come loose and dangling. If you finish in the middle, the bushing goes over it. Step5: Re-install the bushing in reverse order. The bracket bolts should only be torqued to 16-18 ft. lbs. Don't over tighten.